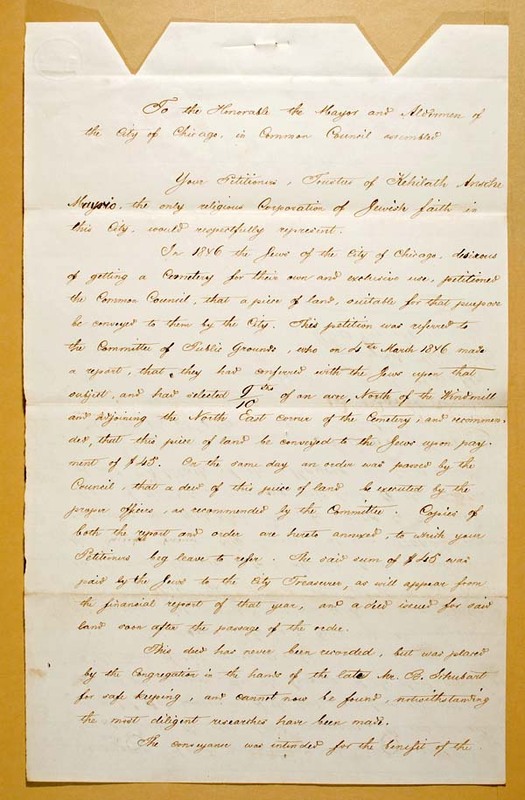 In 1846 the Jews of the City of Chicago, desirous of getting a Cemetery for their own and exclusive use, petitioned the Common council, that a piece of land, suitable for that purpose be conveyed to them by the City. 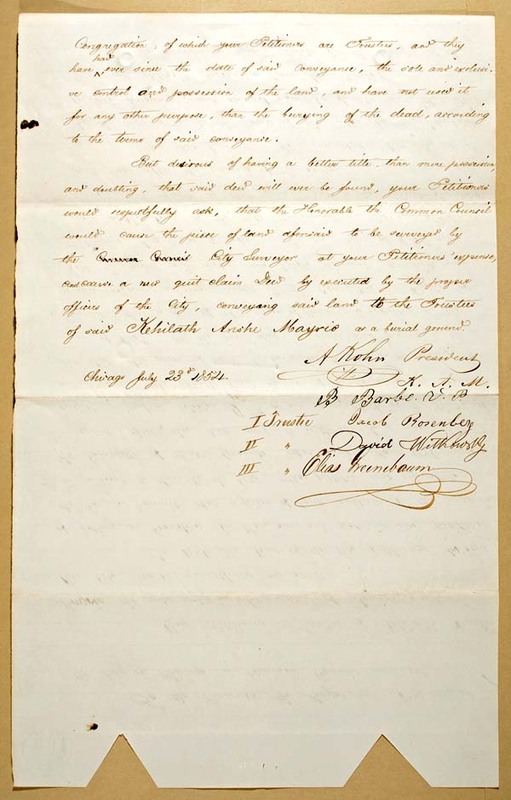 This petition was referred to the Committee of Public Grounds, who on 4th March 1846 made a report, that they had conferred with the Jews upon that subject, and had selected 9/10ths of an acre, North of the Windmill and adjoining the North East corner of the Cemetery, and recommended, that this piece of land be conveyed to the Jews upon payment of $45. On the same day an order was passed by the Council, that a deed of this piece of land be executed by the proper officers, as recommended by the Committee. Copies of both the report and order are hereto annexed, to which your Petitioners beg leave to refer. The said sum of $45 was paid by the Jews to the City Treasurer, as will appear from the financial report of that year, and a deed issued for said land soon after the passage of the order. This deed has never been recorded, but was placed by the Congregation in the hands of the late Hr. B. Shubart for safe keeping, and cannot now be found, notwithstanding the most diligent researches have been made. Congregation of which your Petitioners are Trustees, and they have had ever since the date of said conveyance, and have not used it for any other purpose, than the burying of the dead, according to the terms of said conveyance. 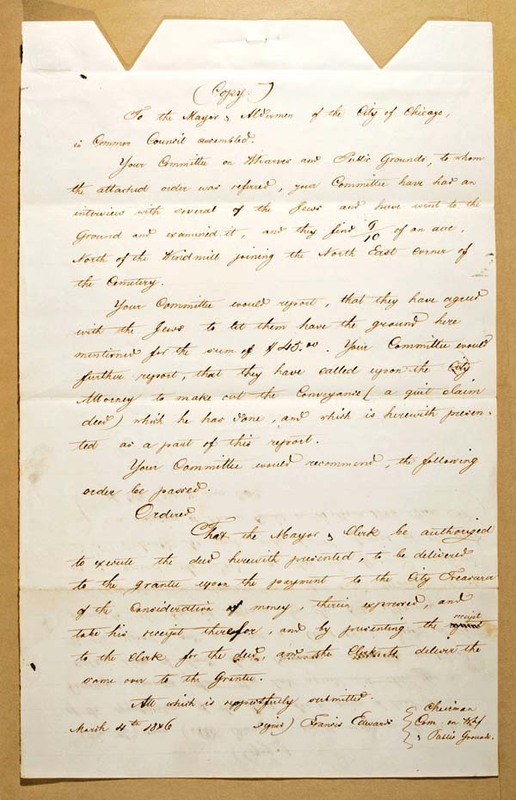 But desirous of having a better title than mere possession, and doubting that said deed will ever be found, your Petitioners would respectfully ask, that the Honorable the Common Council would cause the piece of land aforesaid to be surveyed by the City Surveyor at your Petitioners expense, and cause a new quit claim Deed by executed by the proper officers of the City, conveying said land to the Trustees of said Kehilath Anshe Mayriv as a burial ground. The misspellings in this original document have been corrected in this copy. To the Mayor & Aldermen of the City of Chicago, in Common Council assembled. Your Committee on Wharves and Public Grounds, to whom the attached order was referred, your Committee have had an interview with several of the Jews and have went to the Ground and examined it, and they find 9/10 of an acre North of the Windmill joining the North East corner of the Cemetery. Your Committee would report, that they have agreed with the Jews to let them have the ground here mentioned for the sum of $45.00. 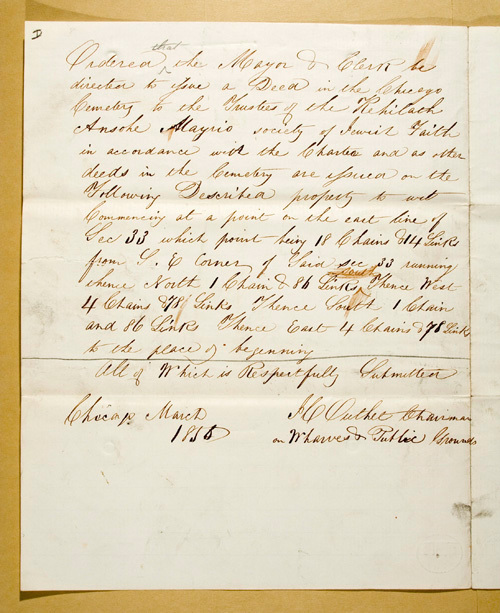 Your Committee would further request, that they have called upon the City Attorney to make out the Conveyance (a quit claim deed) which he had done, and which is herewith petitioned as a part of this report. Your Committee would recommend, the following order be passed. 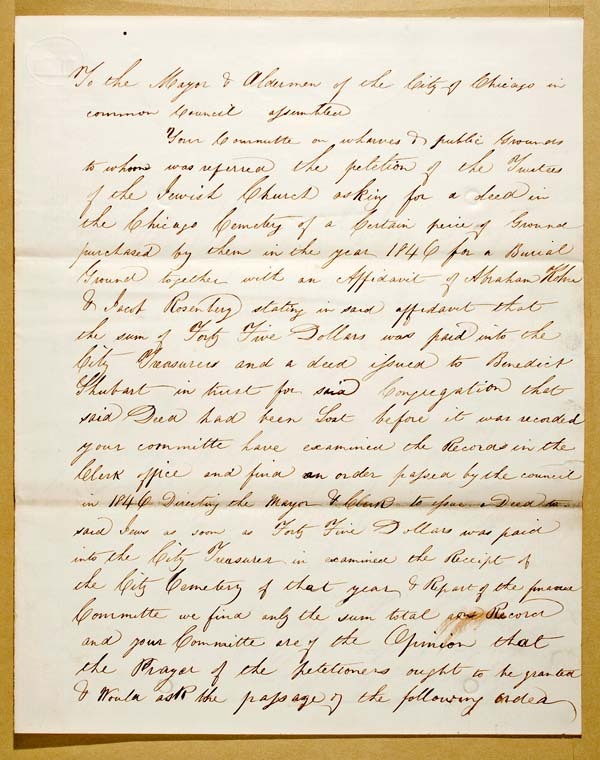 That the Mayor & Clerk be authorized to execute the deed herewith petitioned, to be delivered to the grantee upon the payment to the City Treasurer of the Consideration of money, therein expressed, and take his receipt therefor, and by presenting the receipt to the Clerk for the deed and the Clerk deliver the same over to the Grantee. Chairman Com. on Whf & Public Grounds.